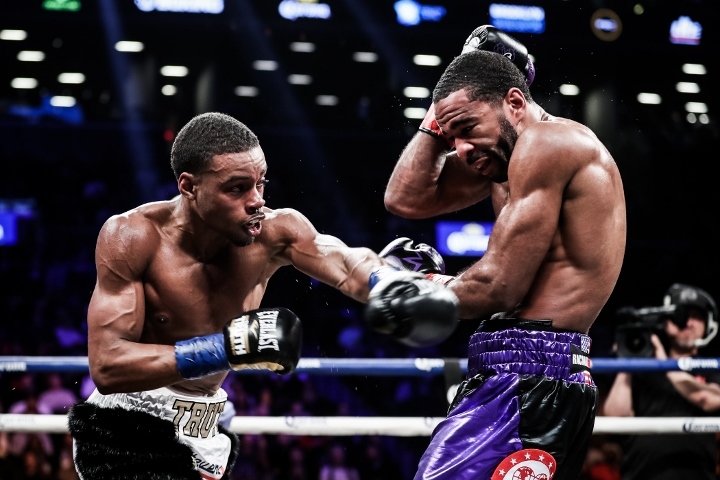 Lamont Peterson’s lopsided loss to Errol Spence Jr. necessitated a long rest for the former junior welterweight champion. It still didn’t demoralize him. Peterson knew he would return to a boxing ring, even after Spence beat him up in their IBF welterweight title fight 14 months ago at Barclays Center in Brooklyn. That time will come Sunday night, when Peterson will face Russia’s Sergey Lipinets in a 12-round welterweight fight FS1 will televise from Oxon Hill, Maryland. In Lipinets, the 35-year-old Peterson (35-4-1, 17 KOs), of Washington, D.C., will encounter a hungry former 140-pound champion eager to earn a welterweight title shot. The 30-year-old Lipinets (14-1, 10 KOs) defeated Erick Bone (22-6, 10 KOs) by majority decision in his last fight, a 10-rounder August 4 at Nassau Veterans Memorial Coliseum in Uniondale, New York. That was Lipinets’ lone action since Mikey Garcia dropped him, won a unanimous decision in their 12-rounder and took the IBF junior welterweight title from him a year ago at Freeman Coliseum in San Antonio. Peterson-Lipinets will be the main event of an FS1 tripleheader from MGM National Harbor. The telecast also will include a fight featuring Peterson’s younger brother, Anthony Peterson, who will square off against Argenis Mendez. In addition to the bout between Washington’s Anthony Peterson (37-1, 24 KOs, 1 NC) and the Dominican Republic’s Mendez (25-5-1, 12 KOs, 1 NC), FS1 will air a 10-round junior middleweight match in which Cincinnati’s Jamontay Clark (13-1, 7 KOs) will take on Chicago’s Vernon Brown (10-0-1, 7 KOs). The three-bout broadcast is set to start at 8 p.m. ET/5 p.m. PT.